Projections of the 15-year growth rate of the working-age population show large variation across states, with some states expecting sharp outright declines. Other things equal, employers in these states are more likely to suffer from tight labor markets in the coming years. 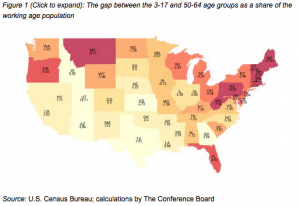 In the northeast and parts of the Midwest, the older population is larger than the younger population. However, moving southwest, the opposite is true. There are some outliers, such as Utah, where high fertility rates are causing the younger generation to grow larger than the older generation. The results for Florida should be taken with a grain of salt, as the size of the older population is boosted by the inflow of people who are younger than 65 but have already partially or fully retired. While for the country as a whole working-age population in the next 15 years is expected to grow by about 5.2 percent, this average masks large variation across states, with some states expected to lose almost 10 percent of their working-age population while others are expected to grow by more than 20 percent. In aggregate, the Northeast and Midwest regions, in which 39 percent of the U.S. working-age population currently resides, are expected to experience a 3.0 percent decline in their working-age population in the coming 15 years.